Organizational Transactional Analysis is a discipline whose focus is on enabling effective communication at all levels of the organization. It looks at development and change from the individual, team, department and organizational levels. This book, and Organizational TA as a whole, operates from an assumption of health - this is a very different approach from other communication methodologies which tend to focus on the problems. TA focuses on building on what is already working, rather than what isn't. From their many years of experience, Anita Mountain and Chris Davidson are convinced that TA offers everyone within the workforce different options on how to relate. Working Together offers up-to-date theory developed by the authors through their extensive knowledge of TA and of the business world. The clear explanations and diagrams in the book outline how you can develop and maintain effective communication and be aware of the processes involved in carrying out decisions and strategies. 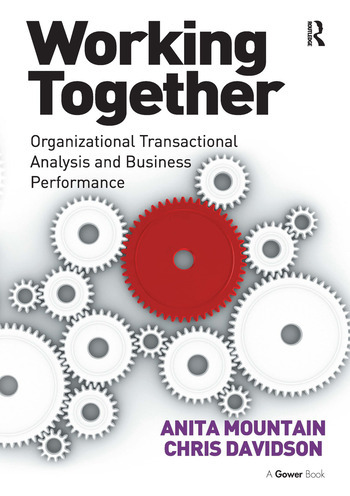 With chapters on how to apply TA in the workplace Working Together is a down-to-earth yet intelligent read and an important resource for those who wish to improve the quality of relationships and improve productivity. It will be of value to individuals, leaders and managers at all levels. Whether the issue is emotional intelligence, stress, poor communication or different departmental/regional perspectives, this book offers a toolkit of resources to support the people processes aspects of the business. Anita Mountain has been working nationally and internationally since 1990. She has trained and coached a wide variety of professionals from Owner/MD's to Consultant Psychiatrists and other trainers, coaches and consultants. As a company, Mountain Associates have worked with multi-nationals to SME's as well as local authorities within the UK. Her training in two fields of Transactional Analysis and the way she uses these has meant that she has been called iconaclastic and her professional expertise is in demand both as a key-note speaker and as a consultant, coach and coach supervisor. Chris Davidson joined Mountain Associates in 1999 after many years of experience in working in the public sector. His wealth of experience in groups and groupwork allied to his knowledge of human behaviour is of particular benefit when working in organizations. Chris Davidson also works internationally training others both in-house as well as in Mountain Associates open Developmental/Organizational TA, and Official Introductory TA workshops. Chris Davidson and Anita Mountain are business and life partners and so the title of this book - Working Together - also has relevance for them. They work as a team, each with their own areas of expertise which, when combined, add up to over 40 years of experience.